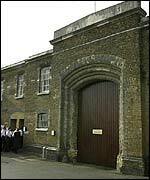 Brixton jail has been the habitual abode of many a villain since it was founded in 1820. But honourable guests have included peace protesters and G V Chicherin,the first Soviet foreign minister. Georgi Vasilyevich Chicherin (1872 - 1936) was a Russian noble in the Czarist Foreign Office who became drawn to revolutionary politics and resigned in 1904. Going into exile in Berlin he first sympathised with the Social Revolutionaries. He later gravitated towards the Menshevik wing of the Russian Social Democratic :Labour Party and finally ended up in London working for the Bolshevik underground. One of Lenin's first acts after the October 1917 revolution was to make peace with Germany and its allies -- a move which hastened the end of the First World War.Chicherin, still in London, was arrested for "enemy associations" and imprisoned in Brixton jail. He was released in 1918 in exchange for Sir George Buchanan, the last British ambassador to the Czarist regime. Chicherin was immediately appointed Commissar for Foreign Affairs and tasked with working to end the Soviet state's diplomatic isolation. This he achieved with considerable success and he continued in the post until ill-health forced him to resign in 1928. He died eight years later.